To train, you need good foundation which is understanding fundamentals. A good master will understand these foundations and help you see and apply these foundations through training. 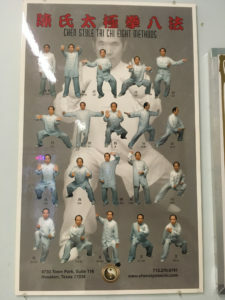 Tai Chi theories focuses on foundation on foundations. Meaning it is multiple layers and requires understanding of a previous foundation before progressing to another. The most basic theory of Taiji is the understanding of the Yin & Yang. Because of this Tai Chi focuses on dynamic concepts, always adjusting and changing to create balance and harmony. The Yin Yang theory is reinforced through out training. Applying this concept means raw force can not be used in Tai Chi. Using raw force negates this Yin Yang harmony. One of the most important concepts of Tai Chi is that Tai Chi is not about raw force. Many practitioners don’t understand this because they don’t understand how to apply the foundations to make themselves NOT tense. Because they don’t have proper training and knowledge of the foundation, they have tendency to use aggressive raw force in Push-Hands or in application of Taiji. This is the biggest mistake all Tai Chi practitioners make by forcing a defensive application. In Taiji there is no upper body strength. Using upper body strength will lead to tension. All forces are generated from the foot and lower torso. This is reinforced by the 13 Fundamentals of Tai Chi. 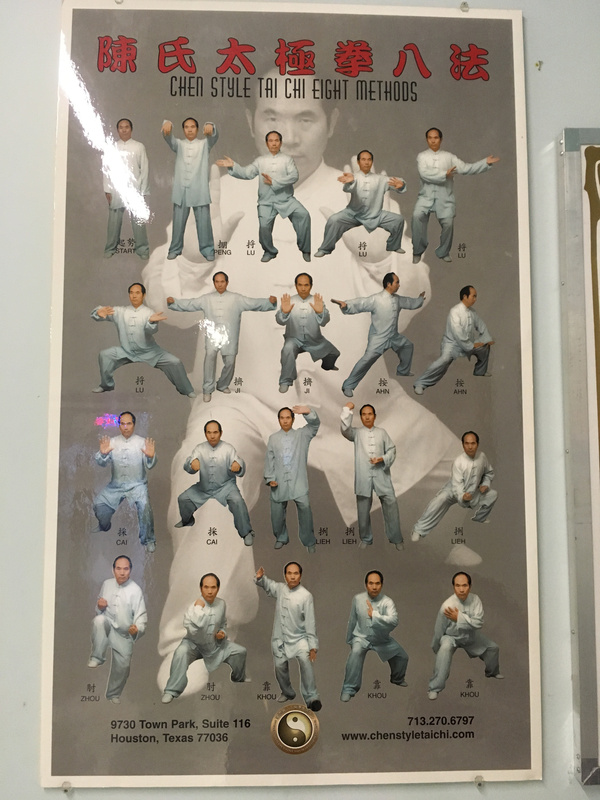 Unfortunately many instructors create their own version of the 13 Fundamentals of Tai Chi. Consist of the 5 Footworks and the 8 Basic Methods (Concepts.) 5 + 8 = 13. The 13 Fundamentals of Tai Chi reinforces the fact that all movements on top are from the foot. These two separate set must be taught to complement one another. Mastering your footwork is crucial in Tai Chi and ALL forms of Kung Fu. The set itself has many rewards. It helps move the qi in the legs. The 5 footworks when done slowly and properly will help strengthen legs and build coordination. The 5 footworks precedes the 8 Basic Methods. According to C.C. Shen, one of the early disciples of Master Cheng Jin Cai, there are 17 Fundamentals of Tai Chi. Qin Na or jointlocks start with a Cai. Qin Na requires understanding of the anatomy of the body and its limitations. Qin Na is found through out Chen Taiji forms. Dan Tian is one of the most important concept of Tai Chi and health. This is what creates energy and is used for many concepts in Tai Chi. Without this concept, a Tai Chi user will always be tired and lacking stamina. It is very often misunderstood as an acupuncture point of Ren 6 but in truth it is a 3-Dimensional concept or a ball that many failed to comprehend. Grandmaster Yang Jwing Ming made many references to this. This is where you concentrate energy to move Qi and not be stiff. The only master that understands this is GM Cheng Jin Cai. The simplest term for Kwa are the hip joints but it is more complex than this. Dong is the area of the inner legs that starts from the groin. These two terms are better defined through training and complement one another. Listening Energy. Developing the sensitivity to react & adjust and still be NOT rigid & tense. This is a coiling effect that mimics that of a silkworm weaving. Commonly defined as Peng with spiral in it. There are many body parts that must align in Tai Chi. One of the most basic one is the alignment of the head, spine and lower torso. Double Weightedness is the biggest fault for beginners. Not only used for attacking. This particular fist is unique. Taiji fist always adjust and changes according to the form and purpose of the movement. Many of the palm opening of the hand in Taiji are those similar to Bagua Zhang. This is the higher level of training that most people will never reach. Every terms listed above are ALL RELATED and INTERCONNECTED and must be taught to complement one another. A good master will help you comprehend the fundamentals of Tai Chi and their interdependency. Copyright © 2019 Art of Taiji. Restaurant And Cafe by Rara Theme. Powered by WordPress.